Today is a special day in the life of “Running with the Big Dog” as it has reached its 300th column in this newspaper. With the special occasion I wanted to select someone who can best illustrate longevity and at the same time came close to the magic number, 300. The person that I selected to help celebrate my milestone is the legendary University of Hawaii at Hilo basketball coach, Jimmy Yagi. Yagi had an extremely impressive reign as Vulcan coach, amassing a career record 252 wins and 126 losses before retiring in 1985. “I retired one year after my father died from a heart attack,” Yagi said. Yagi was named NAIA District II Coach of the Year and led the Vulcan team to the NAIA National Basketball Tournament as District Champions in Kansas City three times. In 1993 this basketball legend was inducted into the inaugural UHH Hall of Fame and in 1997 was nominated by then County Mayor Stephen Yamashiro as the Hawaii state winner as a “SGMA Heroes” in recognition of outstanding contributions to his local sports community. Following retirement and until this very day Coach Yagi continues to volunteer at youth camps throughout the Big Island as well as on Oahu, Maui and Kauai. Since the mid 1970’s Yagi has helped put on a UHH Vulcan Basketball Camp for 180 campers. Other camps include the Hawaii Baptist Academy 4 day camp for 120 campers that he has hosted for 12 years and the Maui Basketball Camp at Baldwin High and Maui Memorial Gym for 180 campers for the past 15 years. Yagi also puts on free basketball clinics for the Kauai County Recreation Agency (17 consecutive years) and the County of Hawaii Parks and Recreation Department for 100 players (14 years). In 2008, he also taught at free basketball clinics for the County recreation division in Kona and Naalehu. And what impresses me even more is that this active 73 year old continues to stay young with regular physical exercise. Yagi can be found most morning at Kamehameha School’s Nae’ole Aquatics Center where he will get a good cardiovascular workout swimming laps up and down the pool. “I’ll swim 40 laps or 2000 meters in the pool five days a week and I also do some leg work on the side of the pool which includes jump pushes and squats in the water,” he said. He might also be one of the best active senior basketball players in the nation as he can drain 15 footers from anywhere on the court. “I still play basketball three times per week and since I can’t run up and down the court like I used to I better be able to hit those jump shots. My jump shot has been reduced to about an inch and a half off the ground,” Yagi said with a grin. Yagi is one of the few people I know that has kept his college playing weight of 150 pounds and more than fifty years later weighs in at 153. Yagi got his start playing high school ball for Hilo back in the ‘50’s and was coached by another legend, Ah Chew Goo. Attending the University of Hawaii at Manoa, Yagi was content with playing on the junior varsity team. “Playing JV meant I got to play in the game regularly as I knew that I’d be on the bench if I was on the varsity,” he said. “Sitting on the bench I learned a lot about basketball and I learned a lot from watching Ah Chew coach,” Yagi said. His tuition being waived saved Yagi $250 for the year, “a lot of money back then,” he admits. “This past Christmas, when I was reading greeting cards from many of my former players, I suddenly realized that I had never really thanked my coach for everything he had done for me,” Yagi said. So Yagi wrote a belated letter to thank his coach and mentor, Ah Chew Goo, for helping him to become who he is today. “I also wanted to give thanks for that $250 scholarship that I received in 1956 and my wife and I decided to pay that back, with interest.” The Yagis then made a $25,000 donation to the UH Foundation as his gesture of repaying that which he received more than 50 years ago. The Yagis have endowed a UH-Hilo scholarship honoring their parents. 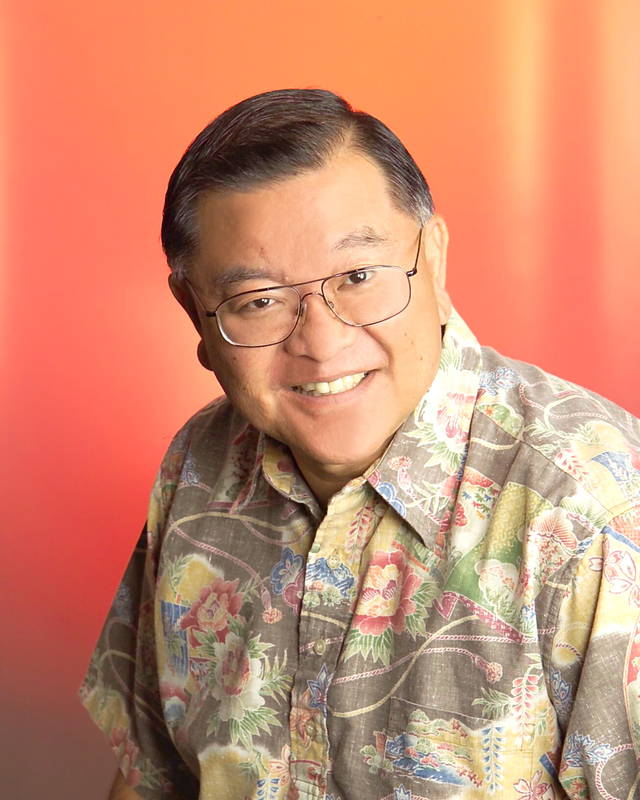 It will be known as the “James S. and Kameko Yagi/Sadao and Bessie Y. Nishida” Scholarship. His wife, Jeanne, is retired and volunteers as the coordinator of Positive Coaching Alliance on the Big Island. There is so much to tell about Jimmy Yagi that this brief column really doesn’t do him justice. I wanted to talk about his UH Vulcans playing the Runnin’ Rebels of Las Vegas in the highest scoring game in NCAA history, or his trip to Europe where he was given a five year contract with Addias to help put on clinics around the continent. Be on time, pay attention, be enthusiastic and always have FUN! FUN! FUN! “Sports bring out character, tremendous character in some kids,” Jimmy Yagi, legendary coach and humanitarian said. In my quest to find healthy/fit individuals to feature in this column I stumbled upon a very unique person with an interesting history of conditioning. Bill Hubbard is not a difficult person to stumble upon, standing six foot eight inches tall and weighing in at 238 pounds; he’d be hard to miss at a party. This was the case when I first met Hubbard at Joe Wedemann’s birthday party in Keaau. Wedemann, who stands 6’4” and weighs just under 200 pounds, was dwarfed by Hubbard which made me feel like a smaller than average person. And Hubbard has an unusual occupation as he repairs underwater pipelines. Traveling all over the world Hubbard has repaired pipelines in the North Sea, Central America, Mexico and California. “The work involved using very large cranes mounted on construction barges to install and repair offshore oil platforms and pipelines,” he said. Diving bells are used as elevators to put divers at the work site and hot water is circulated inside the bell. The divers are provided with specially designed suits due to the severe cold. To perform his duties Hubbard must keep himself in top physical condition to meet the demands made upon his body at extreme depths. “I have always kept myself in top condition for diving work as it is critically important for me to reduce the chance of decompression sickness and ultimately to prevent injury,” he said. At age 12 Hubbard attend an all sports camp at the University of Tennessee where he was mentored in the triple jump by legendary coach, Ralph Boston. Boston was the gold medalist in the long jump in the 1960 Olympics and went on to win a silver medal in 1964 and bronze medal in the 1968 Olympics. During his youth Hubbard hauled hay and did heavy farm work to earn money and the rest of his time was spent playing football and basketball. In high school he received all state honors as an offensive tackle in football and made all district as a center in basketball. Hubbard was so good that he received a scholarship to play football for the Kentucky Wildcats and was on the punt team. “I really had to use speed and quickness just to stay in one piece at that level, so I left school to pursue a career as a professional deep sea diver,” he said. On New Years Day, 1996, Hubbard moved to Hawaii to remodel hi mother-in-laws house. “That was it, I couldn’t go back,” he said. “My wife, Lorraine, is from Hilo and after we married in 1992 it was an easy decision to move to paradise,” Hubbard said. Hubbard went onto build his own home in 1997 which includes a custom wood shop which keeps him busy with a variety of projects. This 52 year old continues to seek new adventures in his very accomplished life. Hubbard has already climbed Mount Lyell, 13,114 feet, in Yosemite National Park; he has climbed the Grand Teton in Wyoming, 13.770 feet, and has done numerous other hikes including the Grand Canyon. “I have no excuse not to exercise,” he says. Today’s regimen includes calisthenics in the morning followed by either a five mile run or a 26 mile bike ride. Then he will swim for 30 to 60 minutes and in the evening he, his wife and two dogs will go for a 30 walk/jog. Hubbard is also an avid skier, since age 23, and once or twice each year will go to Mount Bachelor in Oregon. “I am constantly thinking of deep powder and steep slopes and enjoy competing in Nastar giant slalom events,” he said. Hubbard is a remarkable man who has kept himself in great shape with his love for the outdoors and in finding new adventures. “You can achieve anything you want in life if you have the desire to pursue and never give up, never surrender,” Hubbard said. 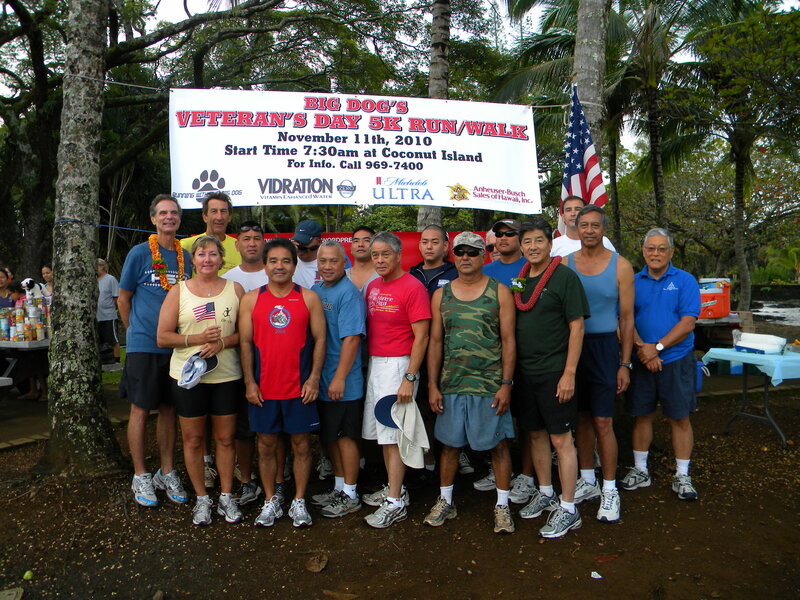 Coming up on Saturday, March 7 is the “Big Dog 5K” starting in the parking area of Moku Ola (Coconut Island) at 7:30 a.m. and hosted by Big Dog Productions. For more information call the Big Dog @ 969-7400. “Happiness is not a matter of events, it depends upon the tides of the mind,” Alice Meynell. A few Saturdays ago saw the 18th annual Hilo to Volcano Ultra Marathon take place. The event starts at Moku Ola (Coconut Island) as sea level, and then runs along the Volcano Highway up to the finish line at Cooper Center, a distance of 31-miles. About 30 hardy endurance runners from around Hawaii and part of the Continental U.S. took part and among them was a world record holder. 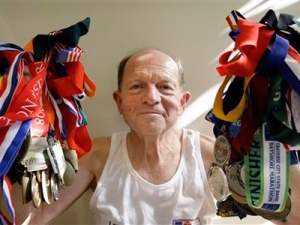 Larry Macon, a practicing attorney from San Antonio, is in the Guinness Book of World Records for completing 105 marathons (distance of 26.2-miles or further) all in the same year. I know what you’re thinking, that this man must be insane and Macon would most likely agree with you. What’s surprising is that Macon stumbled upon the record when he ran 93 marathons in 2007 someone told him that he was pretty close to a world record. That’s when Macon got the idea to see if he could surpass that mark in 2008. “When I hit 50 marathons at the midway point in the year I decided, why not go for it!” he said. To accomplish his record setting feat Macon had to run two marathons each weekend and tied another record when he ran two marathons in the same day. “On May 25 I ran the Darkside Marathon in Georgia and the Vermont City Marathon,” Macon said. Macon’s wife is also a lawyer and her hobby is raising miniature horses, for which she has 600 on their ranch. With Larry running marathons around the county almost every weekend the couple only has time to see each other during the week. Macon did his first marathon 14 years ago and has been hooked on the experience ever since. “I run marathons because I want to and because its fun, so setting this sort of record is sort of a surprise to me,” he said. Now here’s the most surprising thing to me in researching this story and that is that Larry Macon set his world record last year at age 63. That’s right, Larry is a senior citizen but he doesn’t fit the stereotype of someone who should be collecting social security and playing with his grandchildren. In his 14 year history as a distance runner Macon has finished more than 500 races and is a member of the 50 state club (finishing at least one marathon in every state) and ‘Marathon Maniacs’. And this trial attorney, like many superstar athletes, has his pre race superstitions. “I go through this elaborate work in the way I tie my shoes.” Macon said. So Macon’s presence at the little Hilo to Volcano event was his seventh marathon of the month and later that evening he was on a plane heading to Maui to do yet another marathon along with a few of his Hawaii buddies from the Marathon Maniacs crew. Macon, who is a vegetarian, “the only vegetarian in the state of Texas,” he said with a grin, continues to impress everyone with his ability to stay injury free as he continues his ‘Forest Gump” adventures. “I believe in living as if there is no tomorrow and to never look back,” he said. “Who is the happiest of men? He who values the merits of others, and in their pleasure takes joy, even as though ‘twere his own,” Johann Wolfgang von Goethe. The Kilauea Volcano Marathon, held in July at Hawaii Volcanoes National Park, will be no more. The event, which just celebrated its 26th consecutive year, had been under the criticism from the Kupuna Council (Native Hawaiian elders) advisory group to the National Park. Park Superintendent, Cindy Orlando, pulled the plug on the annual event due to growing concerns from the Kupuna Council who believed that Kilauea is a sacred mountain to the goddess Pele. 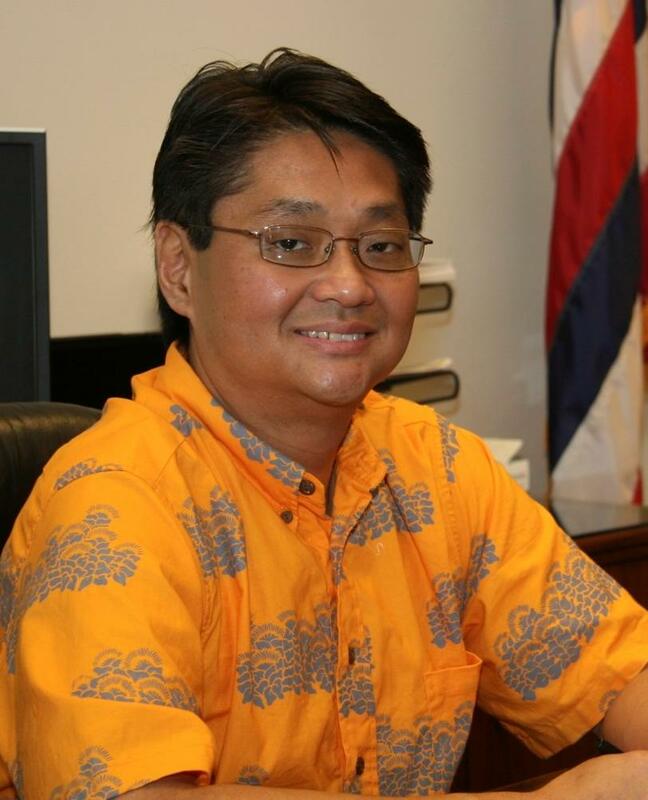 Kupuna Council members lobbied the Park to discontinue the race due to Native Hawaiian cultural concerns in their belief that the 1000 annual runners and walkers were disrespecting their religious culture. (Orlando could not be reached for comment despite phone and email messages being left at her office). “Our determination that this activity was not appropriate to the park was based on compliance checks which require that the event doesn’t impact the park adversely,” Chief Ranger Talmadge Magno said. Magno went on to explain that impact to the trails, the bringing into the park of invasive species, the overuse of the trails due to increased visitors and the sacredness of the mountain to the Native population, all played a role in the demise of the race. Park Service Employee, Tom Foster, echoed Magno’s assessment. “It is a combination of several factors that the Park considered in canceling this race,” he said. Foster, who represents the parks maintenance division on the Kupuna Council, did concede that thre was a vocal voice on the group that wanted the race removed from the park. The 333,000- acre park includes Mauna Loa which rises 13,677 feet above sea level and also descends eight miles beneath the ocean, making it the earth’s most massive volcano. Legend has it that the goddess Pele makes Mauna Loa her home. Hawaiian culture also includes “The Legend of Makoa” who for many runners is the direct descendent of many of the worlds cultural tradition of a long distance runners. Makoa was given the title of “kukini” or foot racer and to this day, when a runner shows great speed, that runner is referred to as “He poki’i no Makoa” or Makoa’s younger brother or sister. Artist Dietrich Varez created the image of Makoa in his art and the image was placed on finisher medals and T-shirts for all participants to enjoy. The Kilauea Wilderness Runs, as it was originally called, was created back in 1983 when Chief Park Ranger, Dan Sholly, used the 26.2-mile footrace as a way of keeping his staff of rangers fit by challenging their endurance. “It wasn’t an easy thing for us to do,” Magno said of canceling the race. “We had to consider many factors, including the eruption of Halema’uma’u. Due to the emission of gases from Halema’uma’u Crater park officials nearly canceled the race this past May, but allowed race organizers to reroute the marathon and 10-mile course to avoid possible dangers. Proceeds from the event have gone to benefit the Volcano Art Center and their many Hawaiian cultural programs and VAC Executive Director, Phyllis Segawa, is scrambling to find an alternative course outside the park. “We’re looking at different options of holding the event up in the Volcano area, but on private land so that we can continue the annual tradition,” Segawa said. Segawa, who was the race director for the first Kilauea Wilderness Run, remains optimistic that a new marathon course can be found to salvage the race. The 26.2 mile marathon had been rated by many national magazines, including Runners World and Marathon & Beyond, as one of the 10 most difficult trail marathons in the world. Due to the “wilderness” nature of the run the park, along with race organizers, limited the marathon field to 225 runners and had set a maximum finish time of 7 ½ hours. Accompanying the marathon was a 10-mile crater rim trail run and a 5-mile run/walk into the crater of Kilauea Iki. The total of three distance races often would attract 1000 athletes from around the world who would marvel at its beauty and charm. Magno left the door open to possibly starting the race within the park, while having most of the distance run in areas outside of the park. 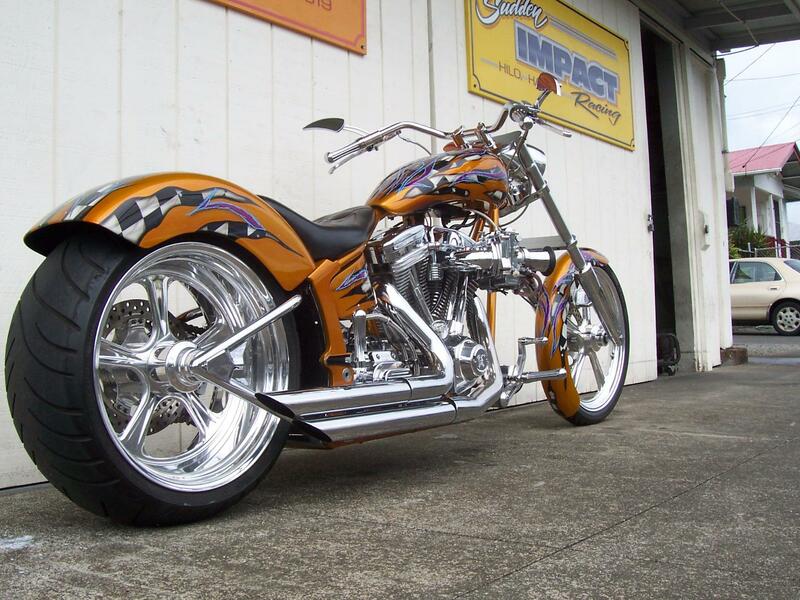 The Big Dog can be reached through email at waiakeabigdog@aol.com. It is called “The Gentle Way” and for nearly 70 years Hawaii Shima Judo Kyokai has promoted it through physical development, proficiency in contest and mental development. Judo was developed in Japan in 1882 by Professor Jigoro Kano and was brought to the Big Island by the sugar plantation immigrants during the later part of the nineteenth century. In 1932 Kano came to Hawaii Island to help lead the way in helping the sport take a permanent foothold in the islands. “Sensei Kano certified select Judo instructors under his Kodakan Judo organization and they came from Japan to Hawaii to form a lasting relationship that still exists today,” Hilo High judo coach, Jack De Lima said. During the 1940’s the Hawaii Shima Judo Kyokai (HSJK) was formed from a variety of different individuals to perpetuate the art of Judo. Over the years HSJK has invited many top ranking instructors and competitors to come to the Big Island to host Judo Seminars and Camps. “Some of these instructors include Daigo Sensei, who was recently promoted to 10th degree black belt and Yajima Sensei, who is the youngest 7th degree black belt in the history of Judo,” De Lima said. Every four years the Shukutoku University from Tokyo sends approximately 20 students to Hawaii Island to help work with our young judoka, according to De Lima. Hilo’s Dave Nishioka, along with HSJK, has gotten involved in the high school program with Nishioka organizing the referees and coaches certification classes to donating score keeping devices to all the major schools participating in judo. New to the high school program is the High School Judo Spring Seminar which brings instructors from Japan during the Spring Break. This year the HSJK seminar will have Hawaii’s own 2008 Olympian, Taylor Takata, instructing the group, along with Danieska Carrion the 2003 gold medalist and two time bronze medalist in the World Games. 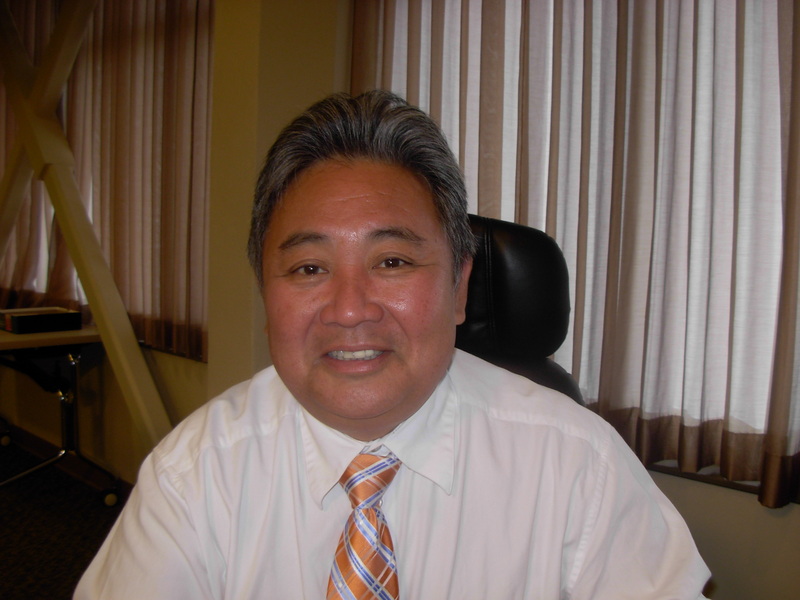 The trio will do presentations on March 24 at Kealakehe Gym from 3:30 to 5:30 pm and on March 26 and 27 at Kamehameha Gym from 9 to 11:30 a.m.
De Lima believes that Judo, “The Gentle Way” helps make our students better prepared for becoming contributing citizens.“In keeping with the vision and the principals of Judo the HSJK has helped to make our students good citizens and have a better quality of life,” he said. The HSJK is a non profit organization which derives its only income from donations and it annual Golf Tournament.